The leaves start to fall and so does the temperature. The warm sunshine is now accompanied by a crisp circulation of wind. Stores are stocked with pumpkin spice flavored everything and apple cider is now back in season, but are you? 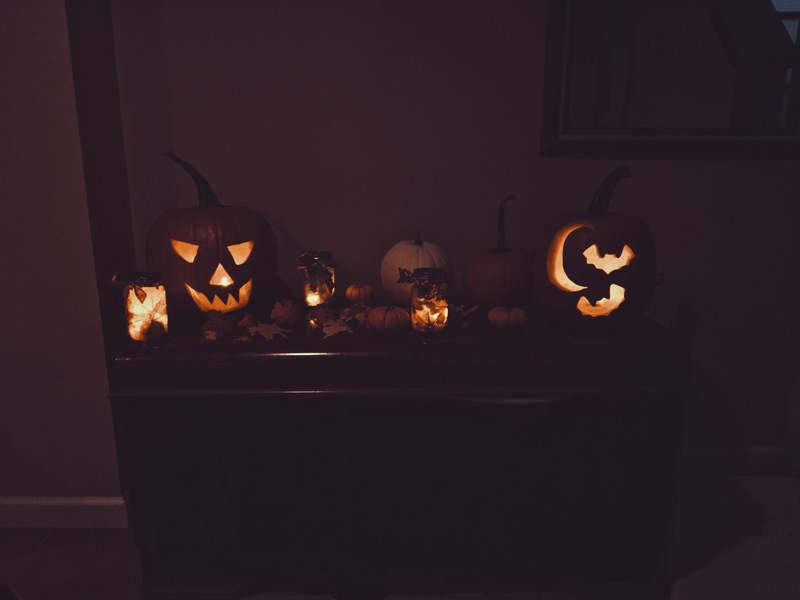 As a college student with very little money to throw around and limited transportation, it can seem very difficult to partake in the spooky season. Do not let distance and money intimidate you. There are many activities you can do for Fall without traveling very far or spending much money! 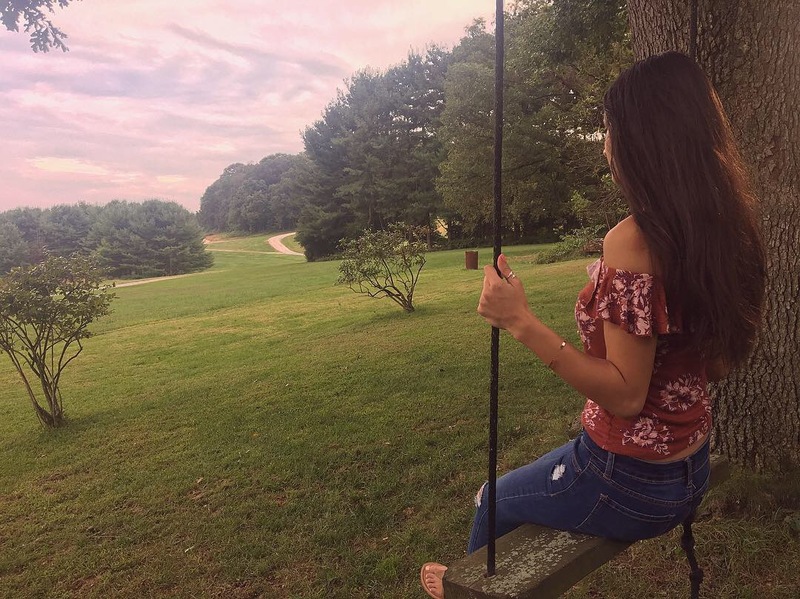 The ideal location for a fall photoshoot would be at a pumpkin patch, corn maze, or an apple orchard of course, but if you have no car or money there are still some great alternatives to capture some cute shots. The outdoors are a great spot for some fall pics with warm natural lighting and bright colored leaves on the ground. There are many spots outside around campus that make great picture spots. 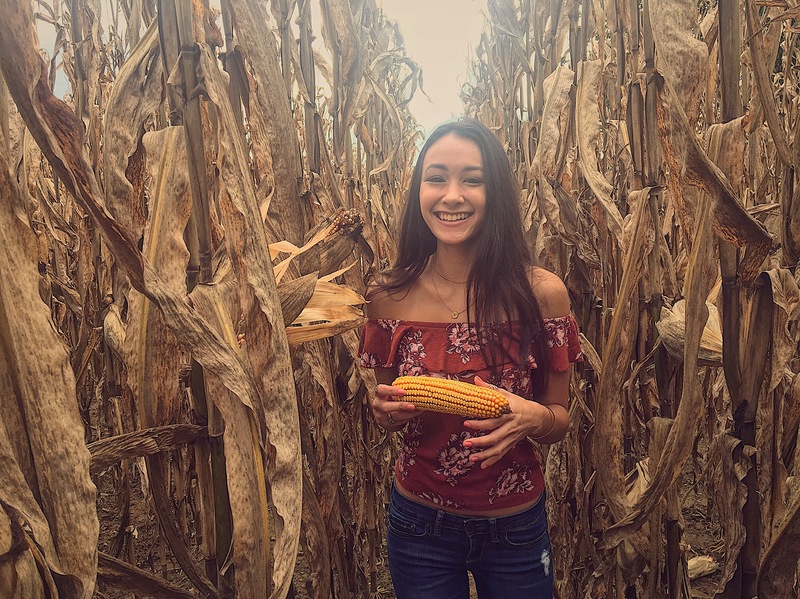 As a commuter from a small town in the country, my home is surrounded by corn fields so the outdoor pictures worked out perfect for me. If you’re not as lucky as me though, there are multiple parks just a short walk away from campus such as Marshall Square Park, Everhart Park, and Hoopes Park. All three of these parks are filled with trees and surrounded by beautiful scenery! Our school also has DSLR cameras available in Brandywine which can be signed out for a couple days. The free rental process is extremely quick and simple. 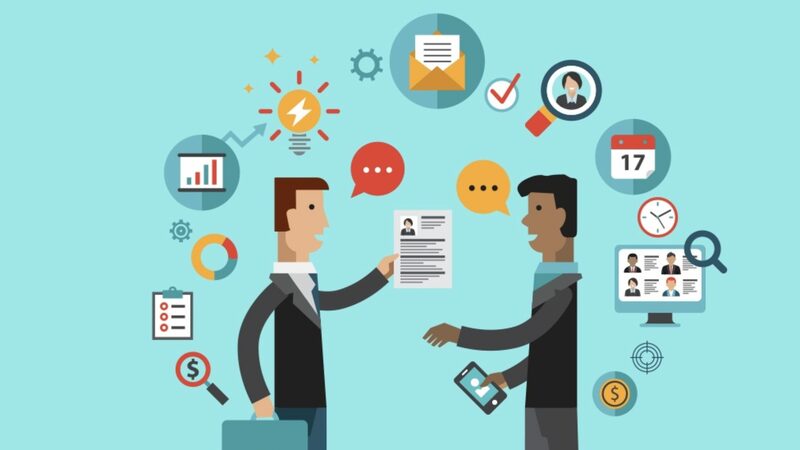 The students in the office are also very friendly and willing to help you learn everything you need! 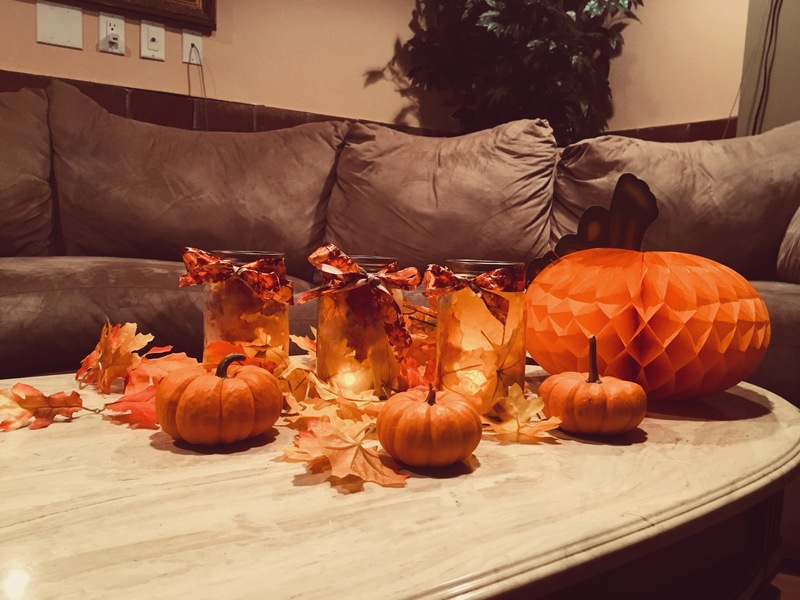 Decorations can be very pricey, especially if you like to frequently redecorate your apartment/dorm to keep up with the different seasons and holidays. So why go out and spend money when you can make your own cute decor for only a few dollars instead? For my room this autumn, I made glowing leaf luminaries. I got all the supplies needed at the dollar store and spent less than $10 to make the three dreamy jars. I took three mason jars and glued some fake leaves inside them. Then I added some battery-operated tea lights inside (since candles aren’t allowed in the dorms), and tied a festive ribbon around the lid. This simple DIY is quick, easy, AND inexpensive which is the perfect combination for us college students. Pumpkins are also a cute fall item to decorate with. If you can’t get to a pumpkin patch or afford to go to one, they sell large carving pumpkins at almost every grocery store for less than $5 each on average. There are tons of different faces and designs you can carve, but I chose to do a simple moon with some bats. I’d love to take credit for free-handing those, but in reality I used cookies cutters! They sell tons of different halloween shaped cutters and all you have to do it push it hard into the pumpkin and your perfect cutouts will make you look like a pro. The beautiful thing about a white canvas is that it’s a blank space with endless possibilities. It’s yours to create whatever you choose and design it however you like. I decided to look on Pinterest for some painting inspiration and came across many sunset pictures with black shadows. These types of paintings are very simple yet elegant. 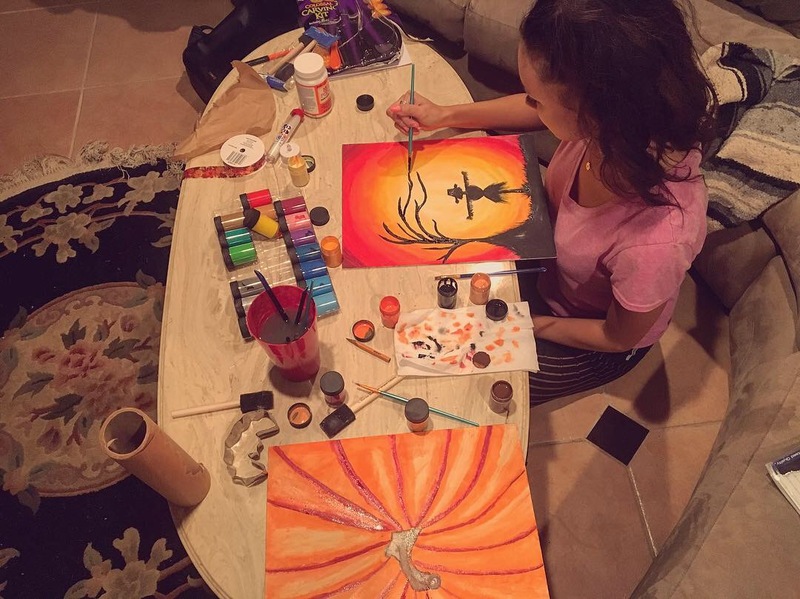 I find painting to be very therapeutic and relaxing so I really enjoyed doing this activity. I also created a new decor item to add to my room along with my luminaries and pumpkins! Baking is an extremely popular thing to do during the holidays, but since most people don’t have ovens to bake in, I found the perfect treat to make using only a microwave. This recipe is a cheap and simple dessert for the holiday season. All you need is a microwave, chocolate chips, circular pretzels, and some icing. The first thing you do is melt the chocolate chips in the microwave. Then lay out the pretzels on a flat surface onto of parchment paper. Next, fill the centers with the melted chocolate. You may need to put the pretzels in the fridge or freezer to speed up the drying process. Once the chocolate is completely hardened you flip them upside down and can decorate them however you like. 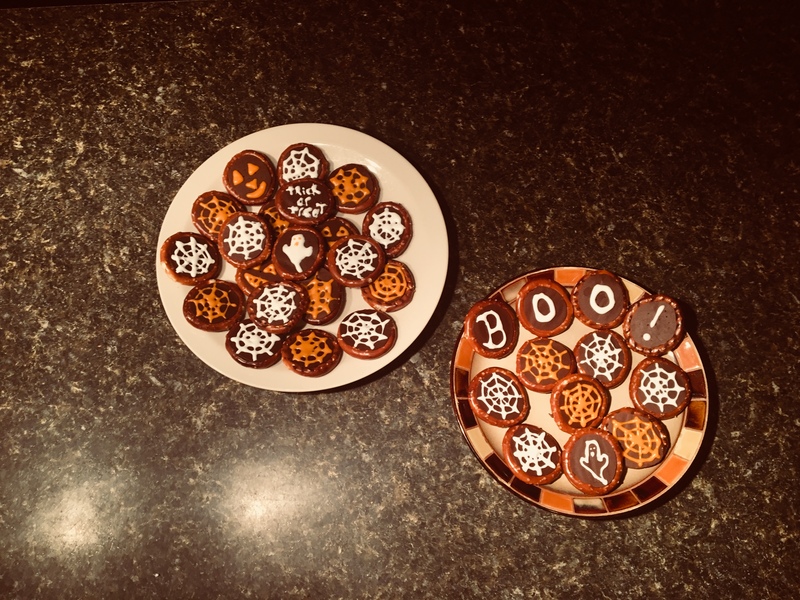 I chose to draw some little Halloween doodles and designs with orange and white icing, but the possibilities are endless. As a college student, you may feel limited in terms of money and the distance you can travel. Thankfully, traveling far and spending lots of money are not the only ways to celebrate the holidays and take part in some fun festivities. By doing a few of the ideas I suggested above, your social media feeds will look exciting and adventurous even though you’re on a budget and staying close to home.